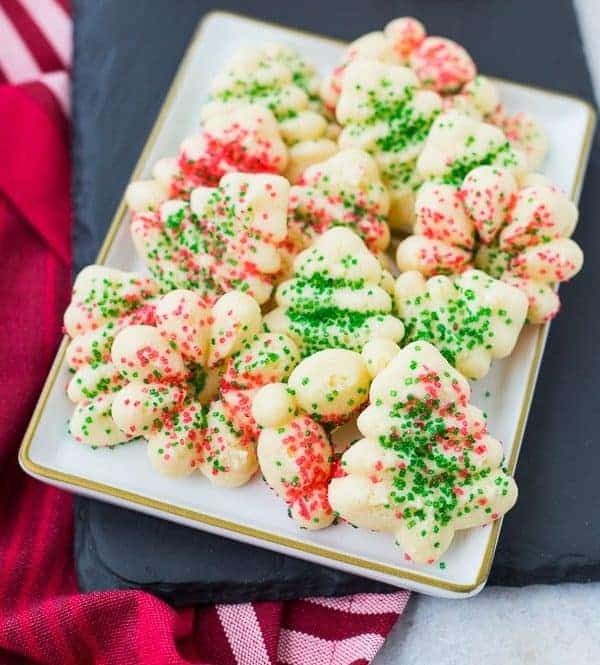 Easy to make and fun to eat, these cream cheese spritz cookies are a Christmas classic that will make a fantastic addition to any cookie platter. 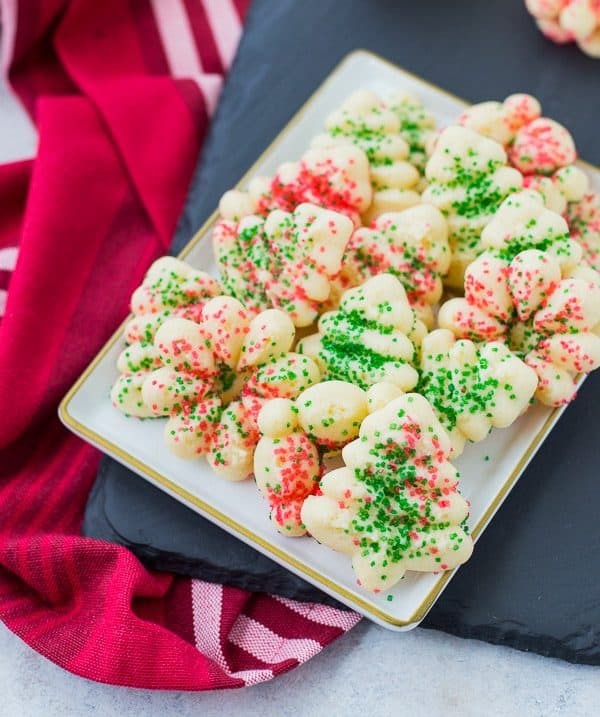 I’m finally coming through with a Christmas cookie recipe, and it’s a classic. With a little Rachel Cooks twist, of course! I tucked these away in the freezer for all the upcoming Christmas events. You’ll need a cookie press for this recipe – I’ve had mine forever but hardly ever use it! This is the one I have and I have no complaints about it, but there are a lot of different brands to choose from. 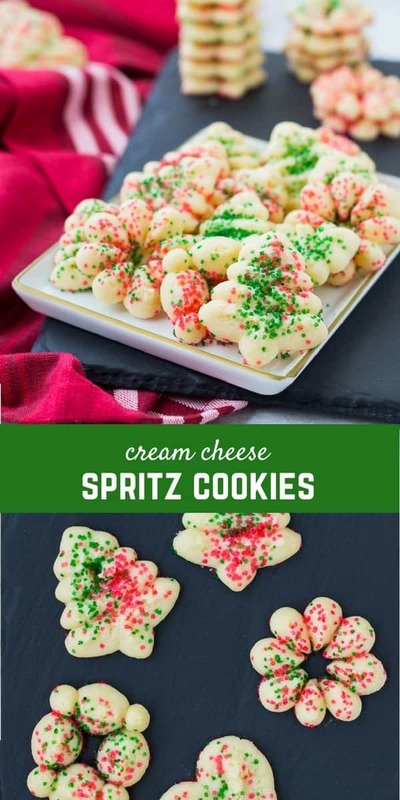 Beyond the cookie press, these cream cheese spritz cookies are very simple. Lots of butter, full-fat cream cheese, sugar, flour. Paula Deen would be proud. I added my own twist by sprinkling in some nutmeg. I adore the flavor that nutmeg gives to otherwise simple cookies. I always put in my sugar cut-out cookies and it has the same effect in these cookies. The nutmeg is what sets these apart from some cookie you could buy at the grocery store. It’s the ingredient that will have people asking for the recipe after they try one of these cookies. 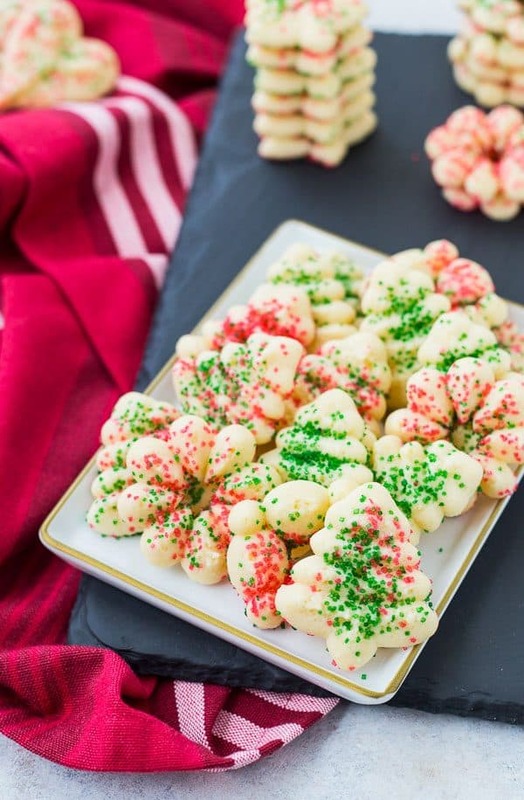 They’re also a super fun cookie to have the kids help with because of the press and sprinkling on the sugar. 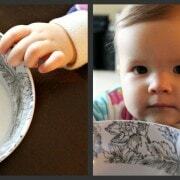 I didn’t have my kids help because I’m the worst type-A mom ever, but for a mom (or dad!) with patience in the kitchen I’m sure it would be fun. Plus N got 4 or 5 new Transformers for his birthday and he played with those for nearly three hours straight, which was amazing. Add different extracts instead of vanilla! Try peppermint (1/4 teaspoon will likely be enough, it’s potent), almond, or lemon! 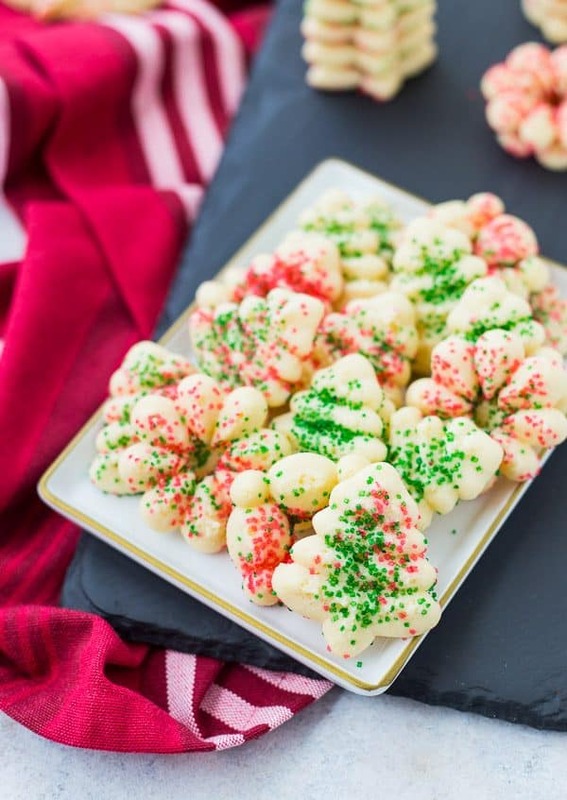 Add food coloring to make these cookies festive colors! Dip in chocolate for extra decadence. Preheat oven to 325°F. 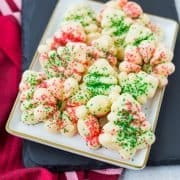 In a large mixing bowl, use an electric mixer and cream together butter, cream cheese, and sugar until light in color and fluffy. Add egg yolk and vanilla extract and beat until combined. Add flour, nutmeg, and salt and stir until all ingredients are combined. 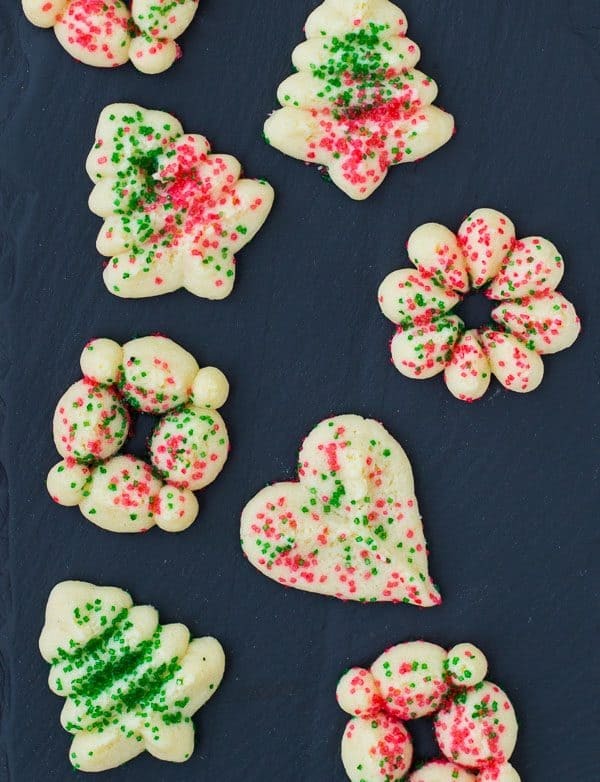 Using a cookie press, press the cookies out onto (unlined) baking sheets about an inch apart from each other. If desired, sprinkle with colored decorator’s sugar. 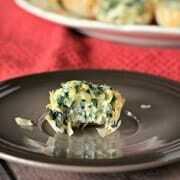 Bake for 15 minutes — they will still be light in color when baked. Don’t use parchment paper lined baking sheets for this recipe as it will make it very difficult to use the cookie press. Verdict: Simple perfection – I love these! 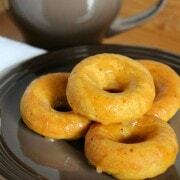 They’re great with a cup of coffee or tea. Husband’s take: I tucked most of these away in the freezer for upcoming parties, but I let Ben sneak one first. He loved it! Changes I would make: None are necessary, but feel free to try some of the twists I mentioned above the recipe. Easy and every batch was perfect. Our cookies looked like the photos in the recipe. Plan to make them again. So happy to hear that! I made these this year too. :) Thanks for taking the time to leave a comment!